Stylish, lightweight and compact, the Olympus E-PL7 is a mirrorless camera aimed at enthusiast photographers looking for better image quality than a smartphone and lenses you can change. 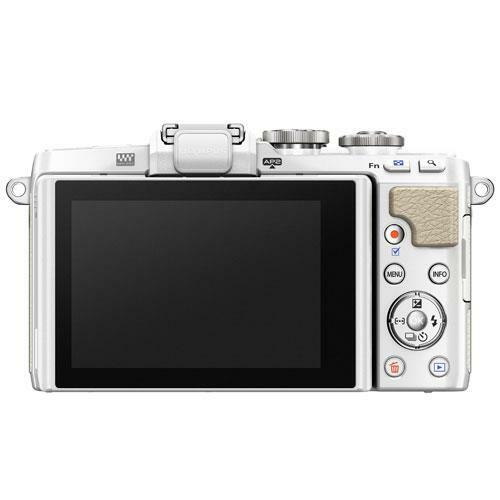 Featuring a high-sensitivity 16.1-megapixel Live MOS Micro Four Thirds sensor and fast 81-area Multi AF the E-PL7 can be used to produce high-quality images that still look good when printed large or viewed on big screens such as tablets and TVs. 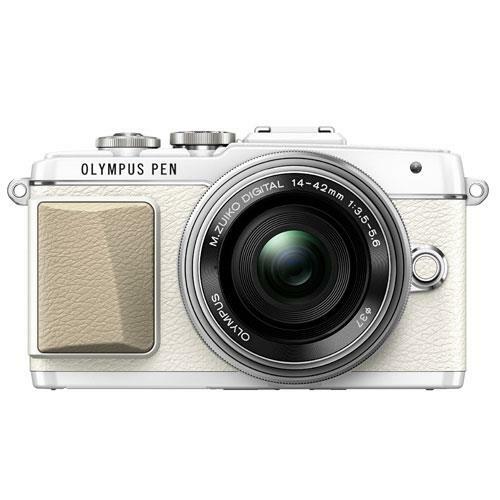 Compatible with over 40 Olympus micro-four-thirds lenses, the E-PL7 is a great choice for a wide range of photographic areas from street photography and fashion, to travel photography and landscapes. With 3-axis in-body image stabilisation technology and a large ISO sensitivity range of ISO 100-25600, the E-PL7 is a good camera for shooting in challenging lighting conditions handheld. It also comes with a built-in pop-up flash when some extra light need. The beautifully styled E-PL7 uses the Olympus TruePic VII image processor, designed to produce high-quality images with natural colours, great detail and low image noise. The camera is also capable of tackling fast-moving subjects, buffering full-resolution still images up to an impressive 8fps. It also has a number of Art Filters and creative scene modes to help photographers get more out of their images in-camera. The camera’s tiltable 3.0-inch 1037k-dot touchscreen LCD offers a sharp display for composing images, with touch control for tactile operation and touch autofocus. 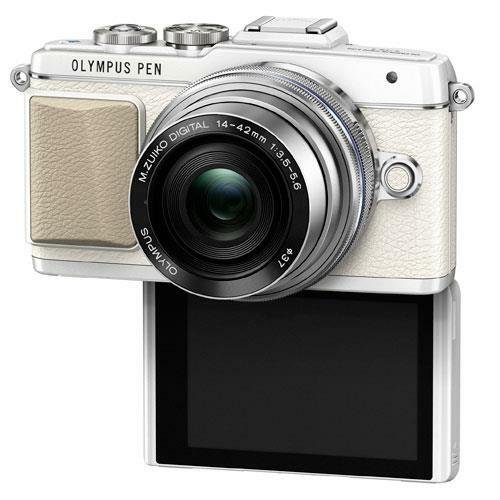 The Olympus E-PL7 in white has a stylish contemporary take on a retro look, with tactile controls. But it isn’t just aesthetically pleasing, it’s an approachable camera, with a tough, portable body that offers full manual control, as well as fantastic creative auto modes. The E-PL7 can deliver quality Full HD 1080/30p video. Using the camera’s 3-axis image stabilisation, the E-PL7 can record steady video footage when performing handheld camera movements. 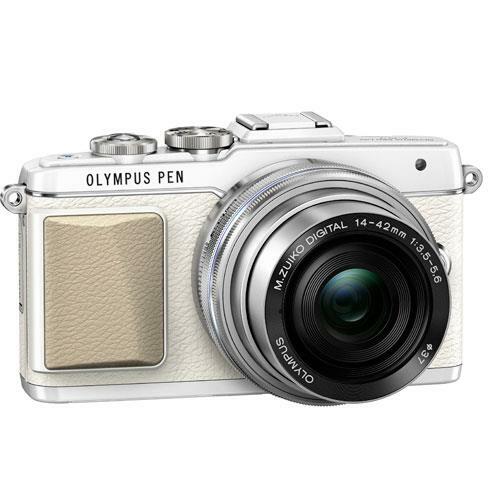 Olympus E-PL7 owners can also use the Olympus OI.Share app to connect their cameras to Android and Apple iOS smart devices using Wi-Fi and NFC, for seamless photo sharing and wireless camera control. The Olympus ZUIKO DIGITAL ED 14-42mm f/3.5-5.6 lens offers an equivalent focal range of 28-84mm in 35mm terms, giving users 3x zoom. Small and lightweight, the 14-42mm is suitable for capturing wide scenes such as in landscape photography, group photos and street photography, as well as portraits. It also has a minimum focusing distance of 25cm.